Aadhaar/UIDAI Going Strong: So far, 20 lakh Aadhaars (the 12-digit unique identification number) have been allotted and from October 1, 2011, 10 lakh IDs will be generated per day. A data centre and a call centre have been set up and an MoU has been signed with the Indian Post Office for logistics support. Enrolments are being carried out in nine states - Andhra Pradesh, Chattisgarh, Jharkhand, Karnataka, Madhya Pradesh, Tripura, Delhi, Maharashtra and West Bengal. The government had allocated Rs 120 crore in 2009 for the project and Rs 1,900 crore in 2010. Smart Cards For Health Insurance: One crore smart cards have been issued under the Rashtriya Swasthya Bima Yojana scheme, a cashless health insurance cover to below poverty line (BPL) families. The scheme was announced in October 2007 and was launched in April 2008. Now Pay Income Tax Online: Finally, online preparation and filing of your income tax returns is going beyond the pilot stage in Bangalore. The government has said that e-payment of taxes through 32 agency banks, with ECS facility for electronic clearing of refunds directly in taxpayers' bank accounts and electronic filing of TDS returns will be thrown open to all cities this year, so we no longer need to scramble to fill up those pesky papers or visit an income tax office, going by the announcement. In order to ready for the rush, the processing capacity at the Bangalore Centralized Processing Centre has been upped from 20,000 to 1.5 lakh returns and two more centres will become operational in Manesar and Pune by May 2011 with a fourth centre being set up in Kolkata in 2011-12. More clarity is being brought into the tax filing system - filing of TDS statements has been "stabilized" and the board will now notify those who are not required to file a return of income as their tax liability has been discharged by their employer through deduction at source. The board will also provide a separate web-based facility to enable a direct, stand-alone interface for taxpayers with the Income Tax Department so that they can report and track the resolution of their refunds and credit for prepaid taxes. The Central Board of Excise and Customs has completed its IT consolidation project, and can now centrally host its key applications in Customs, Central Excise and Service Tax, the budget says. The Customs EDI system now covers 92 locations across the country. Financial Inclusion - Rural Banking On Priority: Under the order of the government, banks in India have identified 73,000 towns (with a population of over 2000) where banking facilities are yet to be provided and will cover 20,000 of them by March 31, 2011. The government had advised them to offer financial services to these towns by March 2012 and we are to expect the rest of the 53,000 to be reached next year, when a total of 5 crore of our rural populace will have access to a bank's services. The banks will enroll and train business correspondents and have been directed to sensitize the rural branch managers to take up this campaign as a priority. A multi-media campaign called "Swabhimaan" has been launched to inform, educate and motivate people about how to open and use bank accounts. Thrust On Innovation & Education: In a thrust to scientific research, the government has enhanced the weighted deduction on payments made to National Laboratories, universities and Institutes of technology, from 175% to 200%. The government will also infuse Rs 2 billion each in Indian Institute of Technology, Kharagpur, and Maulana Azad Education Foundation, apart from other grants to various institutions. The National Skill Development Council (NSDC) is on course to create 15 crore skilled workforce two years ahead of 2022, the stipulated target year, according to Sify. Rural Broadband For Panchayats Delayed: The government has postponed its plan to deliver rural broadband connectivity to all 2,50,000 Panchayats in the country from 2012 to 2014. As of October 2010, 97,476 Gram Panchayats have been broadband enabled including 3,423 in Karnataka. There is no mention of the Rural Wireline Broadband scheme. In January 2009, the USOF had signed an agreement with BSNL under the Rural Wireline Broadband Scheme to provide a 512 kbps connection, under which BSNL will provide 8, 88,832 wire-line broadband connections to individual users and government Institutions by 2014. By September 2010, 2,10,902 broadband connections and 430 kiosks were set up in rural and remote areas and Rs. 80.87 crore was disbursed as financial subsidy under this scheme. MAT Up: The Minimum Alternate Tax (MAT) has been increased to 18.5% from 18% previously. The surcharge of 7.5% on domestic companies has been reduced to 5%. MAT is now going to be applicable on developers (builders) of Special Economic Zones as well as units operating in SEZs. Concessions For Mobile Parts: Concessions available to parts, components and accessories for manufacture of mobile handsets have been extended to March 31, 2012. GST Pilot Portal By June: The government's proposal of the Goods and Services Tax (GST) has taken years of deliberations with various states and finally a portal for enabling registrations, returns and payments through a GST Network will be set up in June 2011. The pilot portal will start with 11 states and will then be rolled out pan India. The implementation of GST will ensure a standard VAT across the States to check tax evasion. The government will also introduce a Constitution Amendment Bill to the Parliament to aid in the roll out of the the Goods and Services Tax (GST), which is expected to result in moderation of rates, simplification of laws and better compliance. Work is also underway on drafting of the model legislation for the Central and State GST. 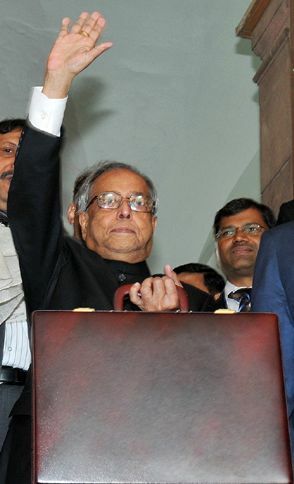 GST was to be launched in April 2011. The government reports that "significant progress" has been made on the GST Network and that the key business processes of registration, returns and payments are in advanced stages of finalisation. For operating the GST network, a National Information Utility will be set up under the National Securities Depository Limited (NSDL), the technology partner. Technology Advisory Group's Recommendations Accepted: The Technology Advisory Group for Unique Projects, headed by Nandan Nilekani, former co-chairman of Infosys Technologies and head of the Unique Identification Authority of India (UIDAI) project, has submitted a report and its recommendations have been accepted in principle and the modalities of implementation are being worked out. The group has been set up to resolve technological and systemic issues of IT projects such as the Tax Information Network, New Pension Scheme, Expenditure Information Network, GST etc. Public Grievance Systems - Aaykar Seva Kendras Return: After a year of silence about the Aaykar Seva Kendras (ASKs), grievance cells where taxpayers can file complaints relating to filing of returns and obtaining of refunds and check their resolution, eight centres will be commissioned this year. Only three pilot projects of ASKs have been conducted in the past 2 years - Pune in May, 2009; Kochi in November, 2009 and Chandigarh in December 2009. The government has said that in 2011-12, another fifty ASKs will be set up across the country. CBEC has also launched a similar initiative and four of their pilot projects have been commissioned. Sevottam is an online complaint system to redress and monitor public grievances in the Public Grievance Cell of the Ministry. This system has been adopted by both the Income Tax division and board of excise and customs. No Excise Duty On Jumbo Rolls: There will be no excise duty for colour, unexposed jumbo rolls (400 feet and 1000 feet) of cinematographic film that are being imported. Giving The Green Signal: India has developed a kit that will converting vehicles into hybrid automobiles. The government has reduced the excise duty on this kit and its parts to 5%. Fuel cell automobiles will also receive the concessional excise duty of 10%. Another emerging green tech - Bio-based asphalt - which is used in surfacing of roads will see a full exemption from basic customs duty. Basic customs duty on solar lanterns has also been reduced from 10% to 5% and duty on inputs used in the manufacture of solar modules/cells eliminated completely.